I thought I would shake things up a bit and introduce a new feature for this fledgling blog. 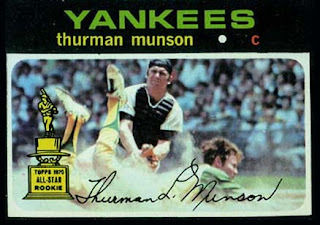 I went through my Topps Baseball Card Book and found what I consider to be the first action shot produced, the 1971 Topps #5 Thurman Munson. I know 1955 and 1956 have sort of action shots, but it is really a face portrait with an inlaid action painting. So, after going through all of the sets, I settled on Mr. Munson as being the first, as his card is the first action shot in the 1971 set. Anyways, so the name of this game is to determine which major league game the action shot took place. I won't be able to figure out every game because it requires both teams in the picture, either in the play or in the background, and some will be removed because of spring training games. So, let us give this a go! Munson making a play at the plate! The Yankees played the A's 6 times at home in 1970, and Munson played in 5 of the games and all of those games were day games. In none of those games was an Athletic called out at the plate. Problem is who is the head first slider? April 25, 1970 - A's win 3-0 with Mincher scoring on a single (nope-slider is thinner); Bando scores on a double (nope); and Green scores from second on a double (nope-no play likely at the plate when scoring from 2nd on a double). April 26, 1970 - A's lose 3-8 with Munday scoring on a passed ball (nope - Munson would be retrieving the ball). July 16, 1970 - A's win 8-2 with Murcer scoring on a GRD (nope); Dobson scores from 2nd on a RF single (hey now); Rudi scores from 2nd on a single to CF (maybe). July 18, 1970 - A's lose 2-7 with no candidates. So, it comes down to Dobson and Rudi. After looking at hair cuts, shoes and stirrup height, I'm going to have to go with Chuck Dobson the PITCHER! Who else could make it close at the plate than a pitcher scoring from second, plus only a pitcher would wear his stirrups so high. The headfirst home plate sliding pitcher! In conclusion, card #5 from 1971 Topps is Chuck Dobson safely sliding headfirst under the tag on Thurman Munson in the top of the 4th from a Joe Rudi single to right field on July 16, 1970! PS - Edited thanks to an Anonymous dude. I turned 5 on that day. It kind of makes sense that it'd be the pitcher sliding head first. Back then, head first slides were almost non-existent. I can see players on the bench saying, "pitchers don't know how to slide." 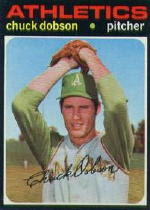 The Yanks also hosted the A's twice in 69 when Munson played - including Munson's Debut game. but neither of those games appear to be a possibility for this photo. nice work. and one of the all-time great cards. Pretty sure the photo on the card is from the top of the 4th inning--not the top of the 5th inning.